World economic crisis hurting gender equality at home, civil society groups say. FOLLOWING the celebration of the 99th annual International Women's Day Sunday, civil society groups have lamented the lack of progress made by Cambodian women, saying their social and economic standing have been set back by the global economic downturn.Chea Mony, president of the Free Trade Union of Cambodia, said that whenever factories have closed, many young female workers have been forced to look for jobs in restaurants, karaoke parlours and nightclubs. "We have no idea what other jobs [these women] can find and where," he said. According to a report by the Free Trade Union, the Kingdom's garment sector employed around 350,000 mostly female workers across 450 garment factories in 2007. But in 2008, 20,000 workers lost their jobs due to factory closures and in the first two months of 2009, the union estimates a further 10,000 people faced unemployment. He went on to say that although Women's Day is internationally recognised, women in Cambodia - especially jobless women - still lack basic rights and access. "Women's rights in Cambodia are still low. As a result, jobless women will not be happy to participate in the discussions about women's rights this year," he said. Chea Mony added that jobless women, especially, lack the knowledge to contribute to the economy. "We think that the celebration of March 8 is just a routine event, but that in practice respect for women's rights has never been fulfilled." Cambodian women facing job losses are also looking abroad for work opportunities in countries like Thailand, Malaysia and Korea. According to an annual report issued by the Ministry of Labour and Vocational Training last week, approximately 74,400 labourers went abroad to work during 2004-08, most of whom went to Thailand, Malaysia, South Korea and Japan. Ya Navuth, executive director for Coordination of Action Research on AIDS and Mobility, agreed that the loss of jobs would certainly impact women and that many would be exposed to exploitation working in the Kingdom's nightclubs or for employers abroad. "Because they have no choice and no hope of finding new jobs, [some women] decide to work at nightclubs or karaoke parlours," he said. He said also that women working overseas could be open to exploitation by their employers, and that the Cambodian government should take actions to ensure foreign investment and employment opportunities for women inside the country. "The government should stop sending Cambodian labourers to other countries where their rights are not properly respected," he said. Sy Define, a secretary of state at the Ministry of Women's Affairs, told the Post that this year's International Women's Day was centred around "women's participation in economic and social development", a suitable focus given the current economic crisis. "We selected the theme in order to show the ability and efforts of women both in and out of the labour system, and to encourage them," she said. "Every job has value so long as it doesn't involve stealing and cheating." "We also want to remind people of Cambodian women's rights and are working hard every day to extinguish violations of women's rights and freedoms." She added that the ministry had promoted laws to protect victims, especially vulnerable women who face sexual harassment and rights violations in the informal sector. "We want to tell jobless women, and those who have jobs in places like nightclubs and karaoke parlours, that every job has value so long as it does not involve stealing and cheating," she said. But Oum Mean, a secretary of state at the Ministry of Labour and Vocational Training, dismissed reports the factory layoffs had swollen the ranks of nightclub and karaoke workers. "We are sure that some workers who have left garment factories returned home or tried to find a job in another factory, as they are already skilled, while others looked for work in the industrial sites that are Cambodia's main growth potential," he said. He admitted that a number of workers did end up in informal service occupations, but said that whatever their occupation, women were contributing towards the development of the economy and were an important part of Cambodian society. "It depends on the individuals themselves, and whether they value or devalue themselves," he said. "Such work does not show whether a person is of value or not." Oum Mean said that the government was promoting the involvement of women in government and making attempts to attract more foreign investment, and hence create more jobs. "The Council for the Development of Cambodia is trying to contact foreign investors, including the European Union, which is looking for investment opportunities in Cambodia," he said, adding that Japan had also expressed interest in setting up a local car factory. "So please don't get confused that only the garment sector can help develop Cambodia's economy." Am Sam Ath, a technical supervisor for local rights group Licadho, said the government should find "better solutions" to the increasing factory closures, since women finding replacement jobs in bars and clubs were looked down upon by many Cambodians. 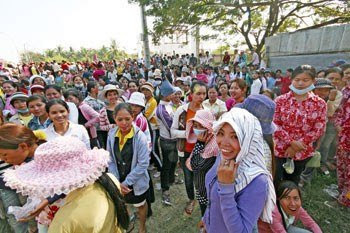 "Anybody who works in informal service positions is not considered in a good light by Cambodian society, which devalues the rights and morality of Cambodian women who take up these kind of jobs," he said, adding that the day's celebration should focus more on those women who are not participating rather than those who are. "The topic for this year's event seems to be in contrast to the real situation in Cambodia. Instead, we should raise real problems women in Cambodia are facing rather than just talking about their participation in society."